It is a curious paradox, but outside London, the one place you rarely find street food … is on the streets. Traders frequent local markets and outdoor events, but due to a combination of factors, notably the British weather and a lack of desirable town-centre pitches, only a tiny minority of them regularly serve food on the streets. The Kitchens, which is due to open in Manchester on 11 June and will bring together six traders under one roof in the city’s Spinningfields development, typifies where street food is heading: indoors, in the form of multi-trader hubs. The Kitchens is unusual in that it will be open for a year, during which time its occupants – including the excellent Chaat Cart and the Latin American-inspired, Yakumama – will compete to win further backing from Spinningfields’ landlords, Allied London. The principle that, in order to thrive, street-food traders need to work together to attract a crowd, is well established. Any romantic notion foodies may once have had about seeing lone food vans operating across our cities, offering a cheap, colourful alternative to the high street, remains a distant dream. Instead, the scene is all about collective action. For example, you will find street food happening (usually indoors) at Newcastle’s Boiler Shop Steamer, Manchester’s Beat Street, Liverpool’s Food Slam and numerous other noisy, late-night events inspired by London’s first wave of warehouse, street-food parties. Simultaneously, at locations such as Trinity Kitchen in Leeds, in the city’s main shopping centre, or at Altrincham’s Market House (a communal dining hall where you can eat from several kitchens staffed by regional street-food operators), several permanent hubs have emerged that offer a less grimy, more family-friendly entry point into street food. 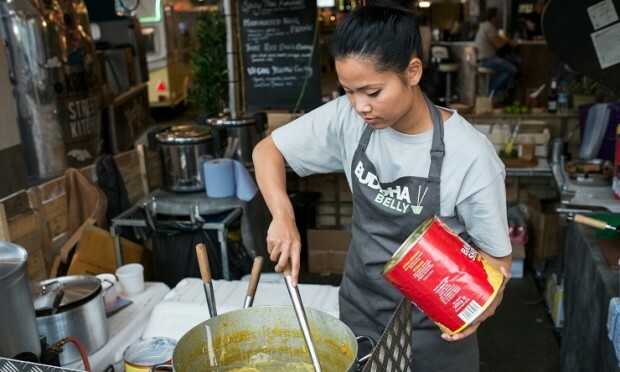 Beyond us being too uptight to eat on the streets, there are other issues that may have contributed to street food failing to break through as a day-to-day resource. Many councils have been slow to open up space to new traders. There has also been something of a backlash against the many bandwagon-jumping traders nocking out distinctly average food. And prices have crept up, often without a commensurate rise in professionalism. As a trader, you cannot turn up with insufficient stock or malfunctioning kitchen equipment and expect people to pay close to £10 for a meal. Punters accept a level of improvised unpredictability in street food, but the prices have to reflect that. And the food still needs to shine. Read more: How can we get street food back on to the streets?